Ridureyu is back with another look at a tough to find Cap movie figure...at least in my neck of the woods! Tell us all about it, R! I feel sorry for toy companies sometimes. Like all forms of media or entertainment, they have to follow certain rules. Choking warnings for small parts, no razor-sharp edges, paint must be lead-free, and no nazis. Even though that last one gets broken from time to time, you'll still see it as a general rule. hence why Indiana Jones fought "German Soldiers" in his recent toyline, or why out-and-out nazi bad guys usually don't have swastikas where there should be swastikas. So, why is it that you can have nazis in everything else, even cartoons, but not toys? Because of what a toy is. A child will buy it (or pester parents to), play with it, and then probably make it the hero. Villains were always more fun - I mean, let's be serious. Who's cooler? Whitey Whitebreaderson (He-Man) or a barbarian wizard with a skull for a head (Skeletor)? Exactly. Toymakers spend many long, sleepless nights worried about class-action lawsuits starting the moment little Timmy takes Action Hitler With Self-Shooting Action, calls him "Captain Moustache!" and makes him one of the good guys. So, it's just a thing. What does this have to do with Captain America, you ask? Well, The Red Skull is Captain America's archnemesis, one of the most prominent villains in the Marvel Universe, co-stars in the Captain America movie, and... is a nazi. Actually, the movie found a way to "fix" this, but more on that later. He has had figures before, but they usually were shortpacked, or wearing weird robo-armor. Therefore, it's kind of nice that the Captain America line includes a figure of Skull, even if it is only one per case. 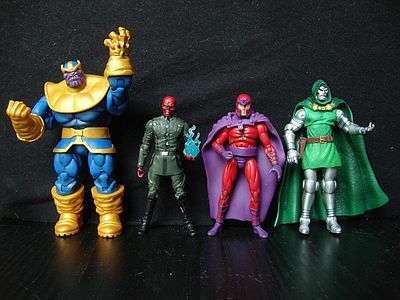 Surprisingly, this isn't the first time the Red Skull has gotten a figure in the 3 3/4" scale, as he was included in the Marvel Universe Invaders box set. That figure reused a body from the Indiana Jones toyline, which makes it pretty out of place among Marvel Universe figures (although it was pretty creative on Hasbro's part). 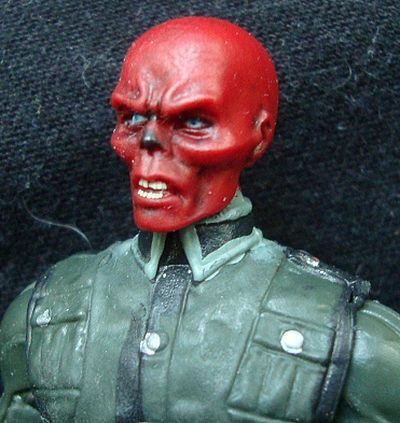 This one is a rendition of Red Skull's movie appearance, and seems to have a completely new sculpt. As for the chances of seeing another Red Skull figure, who knows! Maybe we'll get a few (he is the film's main bad guy), and maybe not. A lot of collectors seem to be assuming the latter, as this figure gets snapped up pretty fast, and its secondary marker price is high. So, is it worth it? 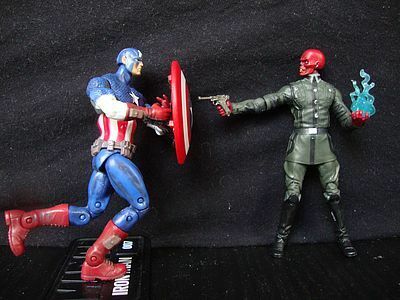 Is The Red Skull a good toy on its own merits, or only there for the "my diorama needs a Red Skull" factor? The Captain America toyline's packaging is pretty eyecatching and functional, although it loses a full star for not having individual character art. I dislike having to actually take figures off the pegs to check them rather than lean in from the side. The stuff inside is kept pretty safe without rubber bands, so that's good. Also, he has a pretty hilarious character blurb, but we'll save that for later. This is Movie Red Skull, not Comic Red Skull. For the majority of his comic time, Red Skull was a normal human who wore a mask. Most outside adaptations (including the ill-advised 1990 movie) gave him a skull-like face, and the comics eventually followed suit. This is the route the movie went - Red Skull's actual face is red and skull-like, with a human mask for a disguise. Oddly, the figure's face is somewhat less skull-like than hugo Weaving's disguise in the film. For one thing, it has a nose. A black nose, but a visible nose instead of Weaving's cut-off bridge. Other than that bit of weirdness, though, this is classic Red Skull. He's got the high cheekbones, sloping brow, and tiny ears that all say "man wearing a cheap skull mask," which pretty much is what the Red Skull is. His uniform matches how he appears roughly half of the time in the movie. 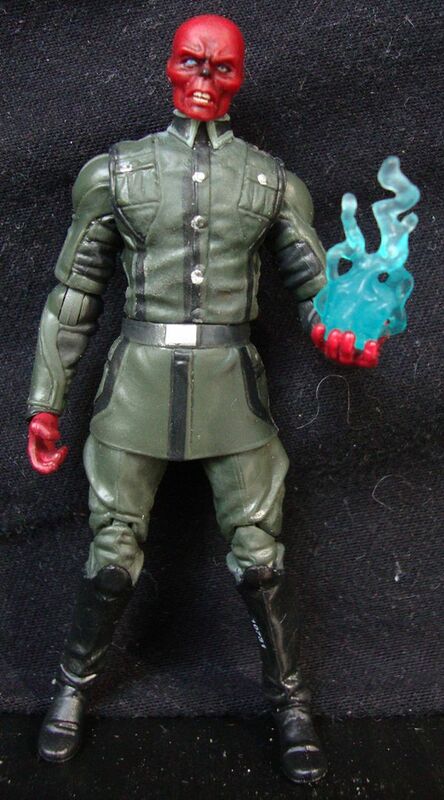 Red Skull uses two basic uniforms - this green one, and a black one with a long trenchcoat. Skull's generic green military-ish uniform (it can't be mistaken for SS Black), obviously does not have a single nazi (or HYDRA) symbol anywhere. That's very smart of them, as the movie apparently takes place in a nazi-free part of WWII's European Front. There isn't much to say about this outfit. it's unique to him, although it is very generic and could easily be mistaken for a reused sculpt. His hands are sculpted differently - one set to hold his pistol, the other wider to hold his cosmic cube accessory. 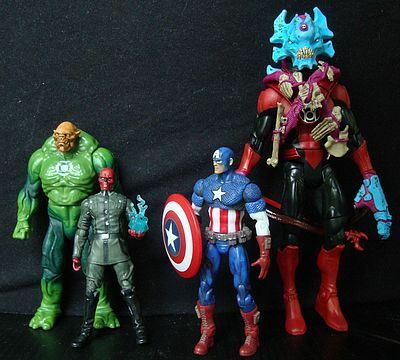 Red Skull is also somewhat short, just a little bit beneath most Marvel Universe figures. The plastic quality feels odd. Something about this figure just feels cheaper and less-durable than other Marvel offerings. It may be nothing major, but I don't like it, as it feels like Red Skull is going to break if I try to turn his joints too much. 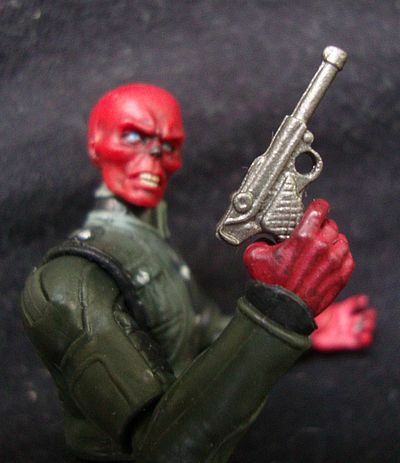 To begin with, I will state something I like very much about Red Skull's paint job: His head is nicely-done. Paint apps are solid, the wash is okay, and it's a good shade of red. A s that is the most important part of the figure, this is a good sign. Other than that, the figure falters. Military green is nice, if a little bland, but the individual paint apps on his uniform are pretty bad. On mine, the silver buttons are misaligned, the black stripes are somewhat uneven, and the paint wash on his arms makes everything meld together. His hands are also a little suspect, and the wider one has developed a couple of pretty-noticeable cracks. Are these cracks in the paint or the hand itself? I don't know, but I hope it's just the hand. All of the points Red Skull gets are for his face, really, the poor guy. This is the figure's lowest point. Take heart that it'll only get better from here! Red Skull's articulation is awful even though he technically has typical Marvel Universe articulation. His ball-jointed head can't look up or down (although it doesn't pop off easily), his waist is only a swivel (no chest articulation), and his legs might as well be immobile. His hips may or may not be swivels, but the skirt of his jacket forces them to stay still. 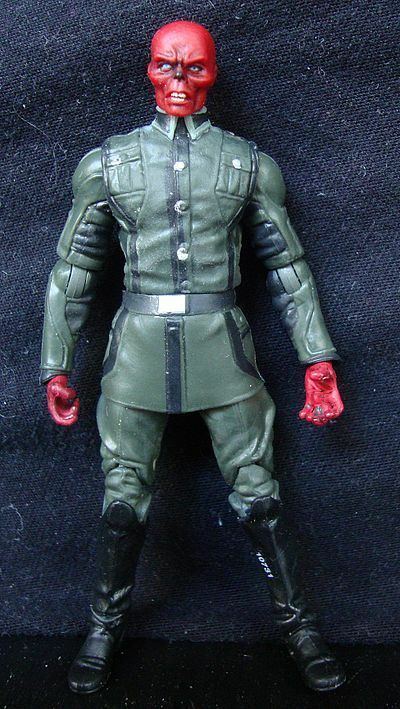 Even with his knee and ankle articulation, Red Skull cannot do much besides stand straight up. 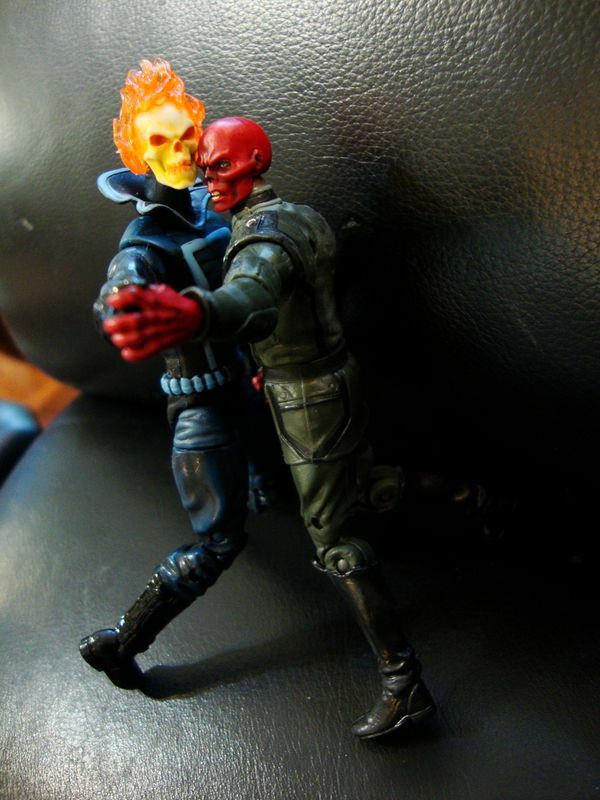 I tried, I really tried, and the best I could do was put him in a romantic dance with Ghost Rider. This is because I am insane. The knees also feel flimsy, and there are some stress marks on my figure. This might just be because of the plastic color, or it might be because Hasbro really skimped out on the figure. Likewise, his arms are stiff and rigid, and feel awkward no matter how you pose them. 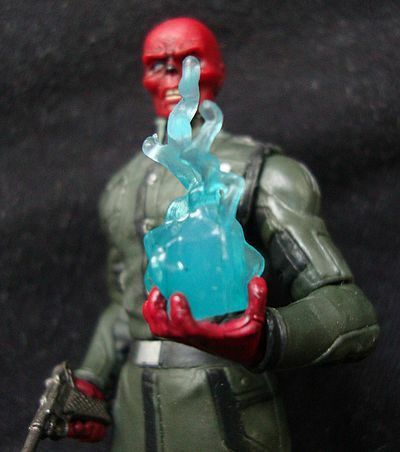 You can get a few good gestures out of Red Skull, but really only if he's holding his accessories. This is not a toy to be played with. It is meant to stand still on a shelf. I love this figure's packaging blurb. But where to start? Is it the complete lack of reference to either the nazis or HYDRA? Nah, it has to be how the Cosmic Cube is shunted aside in favor of a ROCKET LAUNCHER. 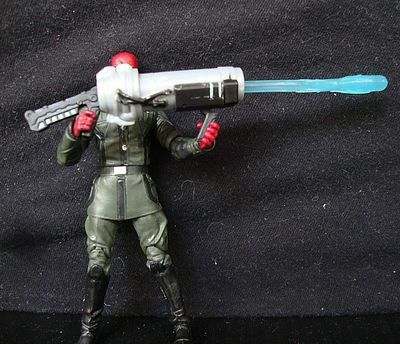 Sure, the item that gives its holder omnipotence may be kind of cool, but Red Skull's plan for taking over the world just isn't complete without his bazooka! Let's talk about that one first. The rocket launcher is big, garish, its handles do not fit neatly into the Red Skull's hands, and it clearly fires a cosmic cube-empowered energy blast, not a rocket. If you want a good missile-launching accessory, go buy Iron Man. It's awful, but it fulfills Red Skull's "action feature" requirement. His next item is his sidearm, a good old-fashioned luger. It's well-sculpted, and colored gunmetal gray, which is an improvement from Crossbones' garish green weapons. 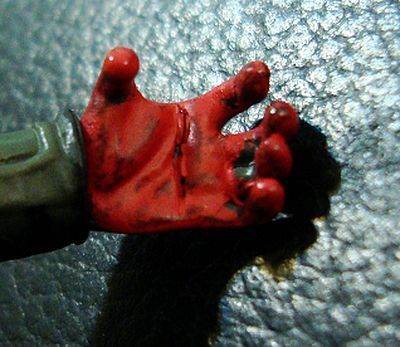 It fits nicely in Red Skull's right hand, although he does not have a holster to stow it for later. But the real star of this set, and the entire reason why he got three scars is... THE COSMIC CUBE! 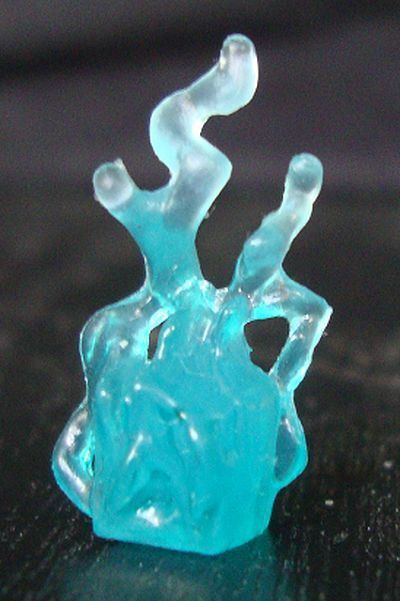 Rather than simply sculpting a cube, Hasbro chose to give it an "energy" effect, but you can clearly see the cube underneath. It fits in Red Skull's left hand in a few different positions, although you might have some trouble getting it to stay at first. The trick is to wedge either a corner oe sideways energy flare between two of his fingers. It's rather nice that we finally got ourselves a Cosmic Cube of our own, and pretty much all of Red Skull's good poses involve it in some way or another. $7.99 is the industry standard for this scale, so I don't have a lot to say. Just don't be suckered into paying $15.99-$24.99 at an online retailer. 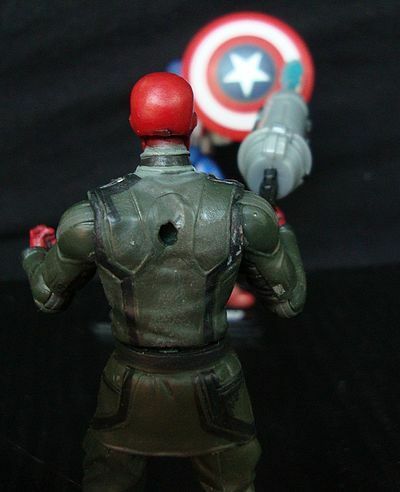 -Red Skull's head does not pop off as easily as on other Marvel figures. I do not want to put stress on his neck joint. -His waist joint is only a swivel, and may eventually loosen or crack. Mine has cracks in the palm of his left hand. I can't tell if it's just the paint splintering, or the hand itself. -He has stress marks in the back of his knees, and I haven't even stressed his knees very much. But other than THAT, the figure is just fine! I really wanted to like this figure, and in some ways I do. It does look all right, especially the head, and his Cosmic Cube is a pretty good accessory. The best use for this figure is a static pose on the shelf holding said cube, and pretty much nothing more. 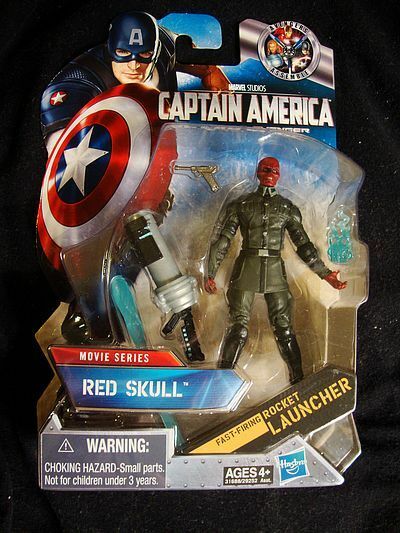 So, nazi toys are hard to distribute, and Red Skull is a nazi. 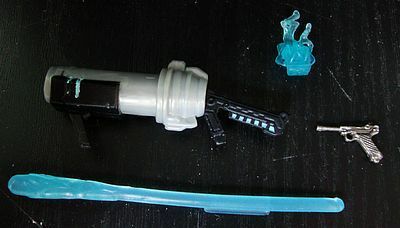 How did Hasbro fix this? They really didn't have to! You see, in the movie, Red Skull defects from the nazi party pretty much immediately, and becomes HYDRA-only from then on. Comic-Skull has maintained his nazi ideology for decades, whereas Movie-Skull only cares about power. The downside of this move is that the whole movie comes off a little strange for it. Were the filmmakers afraid of offending nazis by making them the bad guys? Did they think making a World War II movie actually about World War II would be inappropriate for children? Or were they thinking of toy marketing? Who knows! It's justifiable, as the villains are HYDRA, it's just weird. Just keep looking at Wal-Mart or Toys R Us until you find one on the shelf. Just about everybody else will overcharge for this figure. Beware! This product was purchased for the review by the reviewer. Photos and text by Ridureyu.